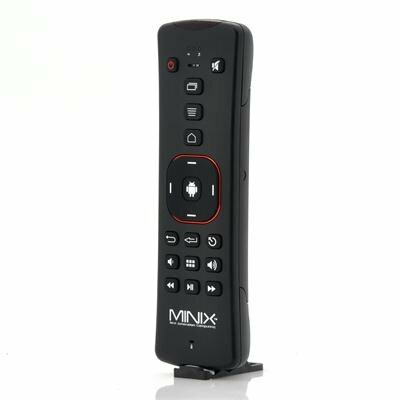 Successfully Added MINIX NEO A2 2.4GHz Wireless Air Mouse - Microphone, Speaker, 10 Meter Operating Range to your Shopping Cart. MINIX NEO A2 2.4GHz Wireless Air Mouse provides a level of freedom and mobility that is hard to match as it features a built-in Microphone, Speaker and a 10 Meter Operating Range. 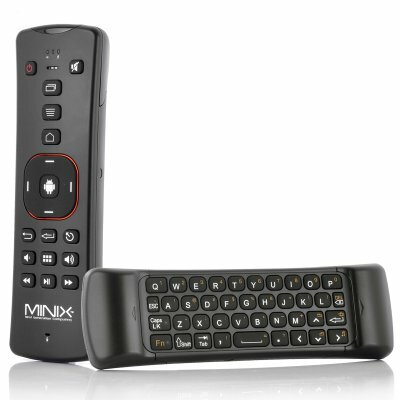 The MINIX NEO A2 is an all-in-one air-mouse, providing everything necessary for a great user experience. It features excellent audio features, a spacious keyboard and accurate air-mouse functions, which makes it fun for gaming. This fully equipped MINIX NEO A2 comes with gaming support capabilities that allow for motion controlled gaming. Superior control and accuracy come standard with the MINX NEO A2, providing the user with an enormous amount of freedom and mobility, and delivering 360 degrees of accurate operation within a 10 meter range. The double-sided keyboard has been specially designed to enable efficient typing, perfect for fast paced and long term typing. If you like to use SKYPE, then the MINX NEO A2 can be used to engage in conversations since has a built-in microphone and speaker. Easy to use, it comes with a USB dongle, which is a plug and play device that allows for quick and simple installation. There are other cool features such as advanced power saving, which allows it greater efficiency when not being used, and a built-in sleep function to save more battery life. In stock now, we guarantee that the MINIX NEO A2 2.4GHz Wireless Air Mouse can be dispatched within one working day with a 12 months warranty. Brought to you by the leader in electronic devices and wholesale home theatre accessories, Chinavasion. The unit does not work very well with the gyro system in fact it only works on a couple of games. the unit east batteries and does not keep sync very well. you need to keep resetting the unit so that it does not fly all over the place. if you have number and charaters in your password it is a night mare ans they have used the numbers and letters on the same keys and you need to press another key for the numbers to be activated. the worst is if you are entering an IP address as the dot .. is not in the same set as the numbers so it is 192 change to letter . (change to numbers) 168 (change to letters) . (change to number) 1 etc etc. most of the time you will need to point well off the screen to make it work as the mouse pointer and mouse are quite far out. this does not matter how far away you are from the unit. or how big your screen is. Integrated keyboard is very good!Air mouse function is OK but not great.